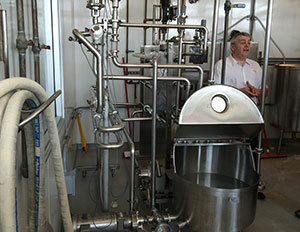 The Zoo is excited to have its dairy cows milking for Milwaukee’s own Clock Shadow Creamery. Since 1987, the Milwaukee County Zoo’s Dairy Complex in its Northwestern Mutual Family Farm has been home to the city of Milwaukee’s only working dairy farm. Recently, the Zoo partnered with Cedar Grove Cheese in Plain, WI, which also owns Clock Shadow Creamery in Milwaukee, to have the Zoo’s dairy milk picked-up and processed into a variety of cheese products. 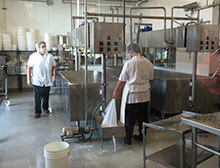 Opened in 2012, Clock Shadow Creamery is a pioneering urban cheese factory committed to being a model local venture. Located in historic Walker’s Point, Clock Shadow Creamery is a pioneering urban cheese factory committed to being a model local venture. On average, the Zoo’s dairy cows provide about 150 pounds of milk per day for the Creamery, which equates to 15 pounds of cheese. A milk hauler and truck from Clock Shadow picks up the milk at the Dairy Complex twice per week. The Zoo’s milk from the dairy cows is then co-mingled with other milk to make many cheese types, including squeaky fresh cheddar curds, quark and ricotta. Theoretically, Clock Shadow could make a small batch with only Zoo milk, but that’s not the most efficient. The Zoo’s Northwestern Mutual Family Farm is home to a variety of species, including Ayrshire, Red and White Holstein, Black and White Holstein, Milking Shorthorn and Brown Swiss. The current milking herd numbers three. Milk quality is based on the amount of fat and protein composition: the higher the fat and protein content, the higher the milk quality. For the past 15+ years, the Milwaukee County Zoo has received a Superior Quality Award for its milk produced throughout the year. In Wisconsin today, dairy production is a $26.5 billion industry. For more information on this unique partnership, please call the Zoo’s Public Affairs and Services Division at 414.256.5411.